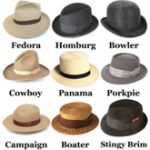 You may remember I wrote an article on hats about 16 months ago. My passion for hats has not subsided. One of the few good things about “progress” is that I know history repeats itself. That means what others have discarded as old and fuddy-duddy will make its mark again, someday. Newer is not always better. Better technology for the things that really improves our lives in a meaningful way is great. Newer for the sake of change is what we want, not necessarily what we need. Well, what I say is that I want more hats. Hats took a backseat in 1960. President Kennedy and the 1960’s crowd wanted their hair to stand out, not their hats. Thus our drycleaning of hats took a dive in revenue. It was not uncommon to find a hat man on the job at most cleaners up until the 1970’s. A few still are out there and they have the tools to do a $350+ Stetson hat look like new again. This old cowboy is still partial to hats, of the western style as evidenced by my picture heading every article since 1991. I learned from my Grandfather long ago how to freshen or completely take a hat apart and rebuild it after hand cleaning. 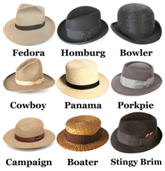 Western style and city style like the old fedoras, which are starting to come back into use today. Fur from hides, (usually from beaver), kneaded and worked with your hands, dipped in boiling water, spreading it out, dipping again and shaping it renders any style hat you want. The hat is roughly shaped by wetting and stretching it over different sized wooden blocks. It is a real art. Hats are one item of apparel that can be worn in any corner of the world and receive immediate attention. As the old cowboys say, “it’s the last thing you take off and the first thing that is noticed. John B. Stetson started the first styled hat for the west in 1865. Most felt hats are made from beaver, rabbit, or wild hare fur. The fur fibers are felted with extremely hot water to make a solid material that both repels water and provides warmth. The most common soil on a hat is dust. To remove accumulated dust, use a soft bristled brush like one made for cleaning suede and starting at the left side of the hat, brush it counterclockwise to keep the surface looking smooth. Continue brushing toward the back of the hat and gently work all around the hat including the upper and lower surfaces of the brim. If the hat has a grease stain or perspiration stains that include body oils, use a bit of cornstarch or talcum powder to absorb the stain. Sprinkle a good layer of the powder on a dry hat (never do this if the hat is wet) and allow the powder to sit on the felt for several hours. Next, brush away the powder with a soft bristled brush. If the hat is dark, it will take several brushings to get rid of the powder (and hopefully, the oil). Repeat if needed to absorb the oil. Never attempt to use liquid laundry stain removers or cleaners. If your felt hat gets wet, shake off excess water. Turn down the interior leather sweatband and stand the hat on the band to dry naturally. Do not dry on a flat surface or the brim will lose its shape. Place the wet hat in a warm area away from direct sunlight or excessive heat. Allow to air dry. If you must speed the drying, use a hair dryer set on low and hold it at least 12 inches from the surface. If you will not be wearing your Stetson felt hat for a period of time, store your hat upside down so the brim will keep its shape. Store in a covered hat box to ward off dust. Hats should be kept in a conditioned space that is not overly hot or damp. Never store in an attic or damp basement. Warm weather straw hats are both fashionable and practical for both men and women. Styles can range from a cowboy style to a Panama hat to a wide-brimmed hat that blocks the summer sun. Prices range from very inexpensive to hundreds of dollars for a finely woven handmade hat. Straw hats can be made from natural plant material (palm, straw, hemp or reeds). Most natural straw hats are woven and then steam is applied to create the shape of the hat on preformed blocks. For oily stains, sprinkle the stain with cornstarch or talcum powder to absorb the oil. Allow it to stand for a few hours and then brush or vacuum away. • To remove perspiration stains, wipe the area with a clean damp white cloth as soon as possible after wearing to prevent body salts and oils from staining the straw. For stains around the sweatband, use 1/2 teaspoon of peroxide and 1/2 teaspoon of warm water on light colored straw. For dark straw, use 1/2 teaspoon of ammonia and 1/4 cup warm water. Use a soft-bristled brush like an old toothbrush dipped in the cleaning solution and work on a small area, just one to two inches, at a time. Clean and then blot with a white towel dampened with plain water. Allow the area to dry completely before wearing again. For scuffs on the hat, try rubbing the area with an eraser. Use a gentle pressure and allow the eraser to do the work. Shoe cleaners sell blocks of powder to clean suedes and fur hats. For wearers of straw hats in the summer, little can protect your hat from the blasted oily stains from gathering around the brim. It is very difficult to remove. Cleaning and soaking methods for me included the use of stain removal all color oxidizing bleaches. Allow your hat to dry away from direct sunlight or high heat while sitting upright on the sweatband. 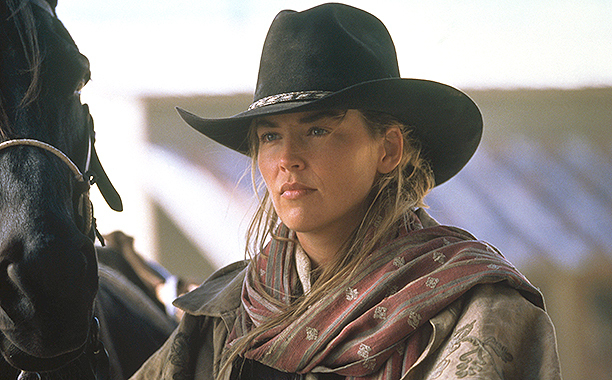 If the hat has a curved brim, like a cowboy hat, do not dry on a flat surface because the brim will become misshapen. Wipe down the hat after each wearing with a clean damp cloth. This will remove dust accumulated during the day and prevent it from becoming deeply embedded. Always use a plain white cloth so there will be no accidental dye transfer. Never leave your hat in your car or a very hot place as this can dry out the straw (or melt a synthetic straw) and cause it to become brittle and misshapen. Always handle a hat with clean hands and by the brim, not the crown. The bane of my existence. Constant pinching can break the fibers. To prevent perspiration, make-up, lotions and hair products from seeping into the straw, turn the sweatband down so it can dry between wearing. If you have staining on the leather sweatband, sprinkle it with cornstarch or talcum powder to absorb the moisture. Allow to sit for several hours and then brush away. Do not spray with liquid cleaners. Good luck on your endeavors and look for a comeback, of which the western style hats never left us, just the dress styles. I’m heading’ to the wagon now; these boots and my Stetson hat are killin’ me!